This essay was originally posted as part of my work for the Virtual Worlds Research Group at Roskilde University. This essay reflects my interest in how pop culture represents new media technologies, such as virtual worlds, as part of the process whereby a society / culture comes to determine what will be the acceptable and thus normal use of such technologies. My reflection on this phenomenon in 2011 suggests the tensions that can occur during such a normalization process; in this case, the seeming fear of virtual worlds that exists in the world. This interest led to the creation of my course “New Media in Pop Culture” launched in January 2014, which I will write about further in this blog. Since the fall of 2005, on Friday nights in the United States on CBS you can find the series Ghost Whisperer (NOTE: the series ended in 2010). The series is about a woman, Melinda (Jennifer Love Hewitt), who can communicate with, and thus help, ghosts. In the third episode of the fourth season, “Ghost in the Machine” (originally aired October 17, 2008), the ghost emerges from a virtual world to draw her into a case about one of the oft-discussed threats of going digital: online predation. In this episode, virtual worlds are both defined through conversation amongst characters and visual representation for those unfamiliar with these new-ish cyberterrains. However, the use of the virtual world, created for the show, is less to explore what these cyberterrains are and more to use them for a traditional morality tale on the dangers of talking to strangers. A brief summary of the episode is this. Melinda is shown a virtual world, alt world-2, and through her introduction to this world she releases a ghost of a man who died while inworld. Initially the ghost only appears as his avatar, Phoenix, looks – hence the “logical” conclusion that the ghost is the gamer who died while playing the game. In trying to uncover who the ghost is, and why he appears so fixated on a teenage girl, Alise, they come to believe the ghost is of a cyberstalker and pornographer the FBI has been after for some time. This conclusion proves to be erroneous as the ghost is revealed to be Alise’s father, who is divorced from the mother, and who created Phoenix to be her friend inworld and to keep an eye out for her. When discovered, he says there is a man preying on his daughter: her inworld friend, Cal, who wants to become her outworld “friend” as well. When the predator picks up Alise under false pretenses, Melinda convinces the father he can stop the predator. The father manages to play havoc with the predator’s car’s electronic systems, effectively stalling the predator until the police arrive. At its core, without the supernatural and cyberpunk genre elements, this is a mystery-suspense story of protection against the dangers represented by people we don’t know. As I do not study the supernatural genre, I will leave that element out. Instead, I am going to focus on how the cyberpunk genre is being used to tell this morality tale. Our introduction to this genre appears harmless enough as the virtual world is introduced in a way to define the basic idea of it: to label virtual worlds first as a place people go to in order to not be themselves for a time. 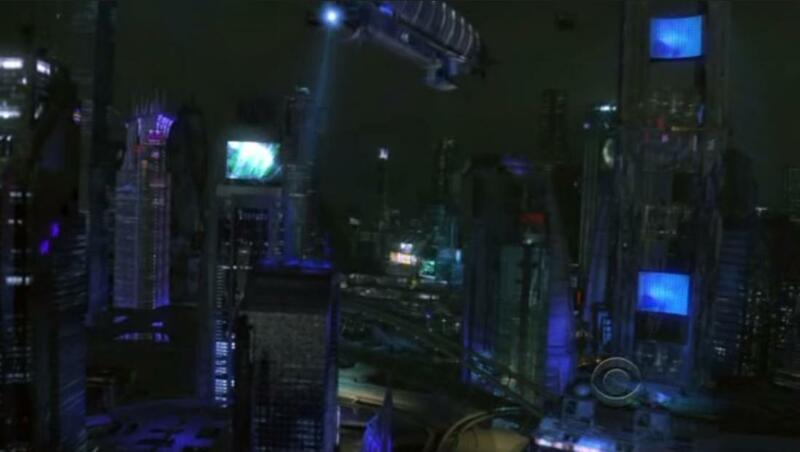 This is done by the explanation of what an avatar is in a discussion between Melinda, her partner Eli, the teenage boy Ned, and Ned’s mother Delia within the first few minutes of the episode. Melinda: Avatar? What is that? Some sort of ancient weapon? Ned: No, it’s me, or what I look like in the game. An animated version of me. Eli: It can look like the actual gamer or be a complete fantasy. Ned: You can pick hair, skin color, clothes. You can be anyone, do anything. Delia: Yeah, that is why I keep a close eye. This brief snippet of five lines does three things. First, it explains an important part of lexicon of virtual worlds by defining avatar. Second, it mentions the capability of representing any aspect of identity that the person desires, with emphasis placed on the wishful or fantasy aspect. This emphasis on the representation of identity that is not 100% faithful to how the person appears in the real world is later repeated with the discussion of a group of teenage girls, the Fringe Girls, who in real life attend a private school where they have to wear uniforms and be “straight-laced”. However, in this virtual world, they are represented far more provocatively, as illustrated below in the screenshot. Finally, this snippet sets up how virtual worlds will be treated for the remainder of the episode. The discussion of the freedom for identity experimentation is juxtaposed with the need for surveillance by parents. This tension represents how virtual worlds are conceptualized for this episode as an extension of public discourse regarding other online technologies, especially IM and chatrooms. However, by the end of the episode, the balance appears more tipped in favor of defining virtual worlds as negative rather than positive. The positive potentials of virtual worlds are only mentioned twice more after this opening salvo, and both times are presented with the countering negative definition. The first example comes at the beginning, foreshadowing the episode and a gimmick that features prominently in the episode and furthers the portrayal of the negative aspects of virtual worlds. Ned: There are games in here. Mostly it’s a place where kids go to hang out inworld. Eli: And it’s educational. I mean you can meet people from around the world. … It’s through the looking glass. Nothing is whatever it seems. The “through the looking glass” comment, referencing Lewis Carroll’s story, foreshadows the gimmick used in the episode to compare the real world with the virtual world. When Melinda touches the computer screen, she finds herself immersed in the virtual world. The virtual world is depicted to the audience through a combination of live action and computer-generated imagery, which was the heaviest use of effects on the show since its premiere (“Behind the Scenes” video). This virtual world is the quintessential dystopia of the cyberpunk genre: dark, lit with garish neon, almost devoid of human voice. When I first saw it, I immediately thought of Blade Runner, and apparently I was meant to, as the producers revealed in the behind the scenes video that Ridley Scott’s future noir had been one of their inspirations in designing the virtual world. Even Melinda is portrayed as a cyberpunk heroine when she goes inworld: bleach blonde, super straight hair; black leather, tight fitting outfit; and dark black face paint designed to look like a mask. This appearance again harkens back to Blade Runner in how she resembles Darryl Hannah’s character, Priss. So you can tell them apart in the pictures below, on the top is Melinda, on the bottom is Priss. This world is also dangerous, as Melinda’s first visit embroils her in a Matrix style fight with Phoenix, seen here on YouTube. The viewer is left with the impression of this place as being dark and dangerous, and wondering why people would go into this place to spend their free time. The second example of the tension occurs in a discussion between Alise and Ned, who is trying to find out the identity of Phoenix. Alise: Anyway, at least I have my online friends I can gripe to. Ned: Okay, but how do you know they’re your friends? You don’t really know who they are. Alise: I don’t really know you. Alise: I think you get to know who people really are more online. Barriers come down. Ned: I guess. But what about when it goes offline, and it’s not what you thought? Have you ever had a thing go offline? Alise: I’ve emailed, talked on cell, sure. Ned: You felt safe doing that? Alise: As safe as anything in real life turned out to be. Ned: You mean like your family? Alise: I thought we’d always be together. Then one day I come home and it’s gone. No more. At least with this I can always count on it being there. It should be noted this conversation occurs after Ned first meets Alise online, through planning, so as to talk to her and hopefully find out why the ghost is stalking her. Ned is essentially one of the people he is worrying her about. That irony aside, this discussion sets up what will become the crux of the morality tale: the fear that people aren’t who they say they are online. And yet, Alise makes some good points about how you can get to know someone online better than perhaps in person. Various social scientists and internet proponents continually argue that the ability to be anonymous can be very freeing and allow people to be more themselves, who they want to be and are, than they can be in real world interactions. However, there are just as many who argue the anonymity allows for baser and less beneficial activities, like flaming and trolling, to occur. Ned, a recurring character who knows what is going on, asks the questions and frames the discussion, while Alise is able to produce a sympathetic seeking conclusion designed to have us empathize with her plight. This framing produces an uncertainty about who is right – an uncertainty the episode answers for us by revealing Alise’s online friend to be an offline criminal. Now this negative consequence of online predation is not unique to virtual worlds: the activity and fear of it predates the emergence of MMOs and MUVEs. But the rising number of virtual worlds targeted at children made these worlds good creative fodder for storytelling. They are new and uncommon enough that no one has really told this story, making the story unique. They are also only on the verge of becoming a mass culture phenomenon, so that the majority of people may have heard about them without really knowing them. At the point of time when the episode was created and aired, virtual worlds were an unknown curiosity, making it perfect exploitation to tell a morality tale about parents’ worst fears. The worlds were becoming something their children were engaging in, and yet the parents don’t know that much about them; that uncertainty can become fear through suspenseful storytelling. And it is not just this morality tale aspect that portrays virtual worlds in a negative manner. The conceptualization of virtual world users as gaming addicts is also mentioned. Melinda: I did a search for anyone who died while gaming, and surprisingly there are a few. I narrowed it down to that guy, one in Korea, and one in Oregon, Curtis Green. Jim, Melinda’s husband: Died after five straight days of gaming. He didn’t eat, he didn’t sleep, didn’t drink? Melinda: Nope, he died of dehydration. 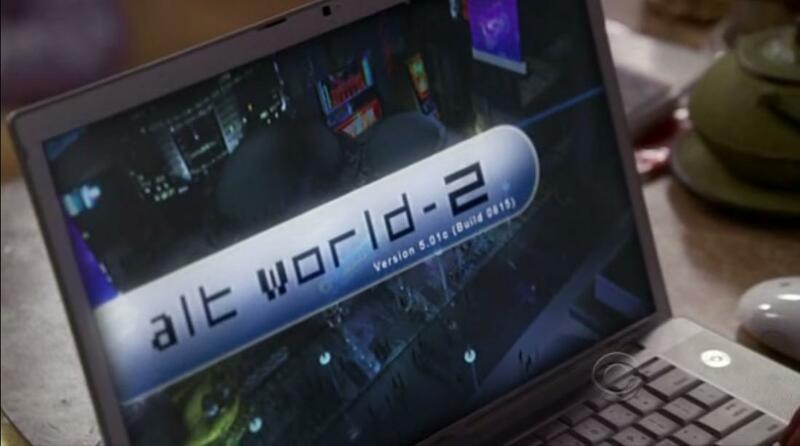 This running gag, as the information is repeated in the episode with disbelief every time, is an exaggeration of actual occurrences, and is perhaps more similar to an urban legend people unfamiliar with virtual worlds may have heard – all about the dangers of becoming too addicted to online gaming. The complexity and inability to engage in virtual worlds is also mentioned indirectly as a drawback. At one point, in trying to find Phoenix, Melinda complains she hasn’t been able to figure out how to control her avatar. In my experiment exposing inexperienced people to virtual worlds, this complaint is most common, in both the MMO and the MUVE. But in watching how the episode shows people controlling their avatars, I believe I would also be confused if I was engaging with the fictional alt world-2. At times the people are shown using the standard arrow keys for movement, but what is happening in the virtual world does not seem to correspond with what the people are doing with the controls. Most viewers, unfamiliar with virtual worlds, would not notice this discrepancy. However, the failure to properly portray virtual worlds in this regard ties back in with the overall apparent intention to portray the more negatives of this medium. This improper portrayal is furthered by the mislabeling of alt world-2 as a game. The world is portrayed as a stand-in for Second Life, the most widely known MUVE virtual world. Second Life is not a game. In my experiment this was the single biggest confusion about it. People going into Second Life expecting the structure of a game quickly became dissatisfied with the experience and seeming lack of purpose in the world. However, alt world-2 is consistently referred to as a game. The people who engage with it are players and engaging with it is called playing. To be fair, there is a virtual arcade in the world with arcade-like games for people to play through their avatars. However, alt world-2 is not depicted as an MMO, which is a gaming structured virtual world. The usage of terms like game, play and player when referencing an MUVE only further the confusion in the general public about these media. This confusion could be detrimental to the future possible applications of MUVE. If people go into an MUVE expecting a game and not being provided with such, then they may be more likely to turn away from it, as they did in my experiment. At some point, this confusion may mean all virtual worlds will have to include some type and amount of gaming structures to remain viable in a crowded mediascape and marketplace. In conclusion, virtual worlds are used in this episode of Ghost Whisperer not to educate the general public on what constitutes a true MUVE. Instead the confusion between MMOs and MUVEs is left intact because the real goal is to capitalize on the tension of curiosity and fear that circulates around these media, so as to craft a compelling mystery-suspense story. Here the tension focuses on the phenomena of identity, cyberstalking and online predators. These are not new tensions. But the new-ish cyberterrains gave the storytellers the ability to play these tensions, and the related fears of the public, in a new way.